Sometimes a child will stim due to a need for sensory input, which is different for each child. Some children may require small amounts of sensory input to feel regulated, while others require much larger amounts. To address these stimming behaviors, you must provide your child with the appropriate amount of sensory input throughout their day. We live in this wonderful world full of different terms for various things. My daughter is what I would call a mover and a groover aka an “avid stimmer”. I think it’s beyond rad when she does anything along the lines of stimming and as a family we encourage her to be her. That is what it should be like for anyone on the spectrum or living with a sensory disorder who needs to stim at times. It is not a behavior that is uncalled for or should be categorized as a behavior to punish. If someone were to punish you for simply stopping and taking a moment when you need to calm down how would you feel? Or if you decided to yell and clap loudly in excitement due to your football team winning or baseball team scoring? All of those behaviors are normal right? Stimming is normal to and for those on the spectrum, it’s also necessary and helpful. It should never be something that someone is neglected for or punished for. Pick your battles when it comes to this subject please. People just don’t know all the facts about those who they consider “different” I get it, honestly I was you once too. 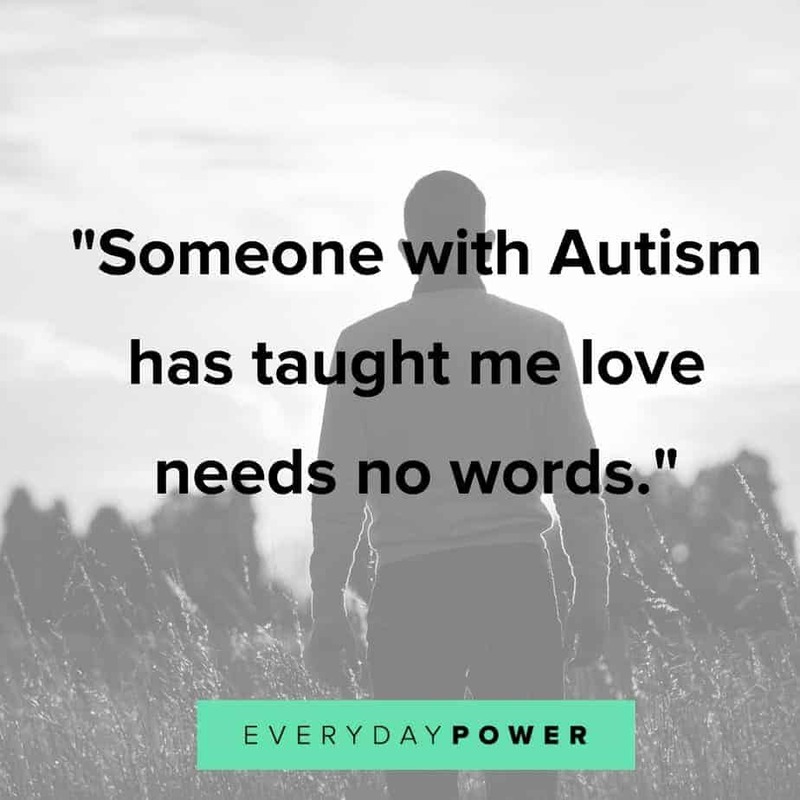 I had no clue when we decided to have a baby that I would be a special needs mom and have a child on the spectrum with complex medical needs. Now here I am living the life and doing the best I can while trying to take in every moment and second that I can with my little girl, she really truly lights up my life. The first time she starting to take a toy and continuously press the button over and over and over while literally walking in fast small circles, I was scared. Not because she scared me! But because I just thought Oh no, she is going to fall smack on the floor and hurt herself or become dizzy and fall over. She does have cerebral palsy too, so being the over protective parent that I am, I interjected and stopped her. I took her toy and held her and said “Hey what are you up to?” This was poor planning on my part, she stomped her feet and cried out while running away from me. She was obviously very upset and at that moment, so was I. It took me a split second to realize that I shouldn’t have stopped her, I should have let her continue and keep on keeping on. She hadn’t tumbled down and she was even trying to verbalize sounds…so why did I do that?… Well folks, parenting is real and raw, you make mistakes and you just do your best to keep the little people alive. I learned a lesson that day, since then I don’t stop her ever, if she is safe I let her be her. She gets her toys and makes her crop circles anywhere she wants… presses buttons over and over and over… makes very loud noises (almost sounding mad or upset but she isn’t)… sometimes she does overstimulate herself and she will run from her own stimming but at least I can be there to help her after. You see I really do have a flaw on parenting, I try to control almost everything even if it’s out of my control. That has been one of the hardest parts of this journey with my daughter so far. I can not control anything about her life, I have tried so many times already and I have had to commit to this new life of learning to go with the flow, even on days where everything seems so sparse. There are a lot of things that can help my little one calm down and she even has her own ways of stimming that her other friends on the spectrum don’t do…everyone is different, everyone and this is why letting her be herself is so important. There are times where I do have to watch her close and make sure she doesn’t walk off of ledges or into walls. There are a lot of moments where I do turn on the helicopter parent switch and hover, but I try to let her be in her own natural state no matter what. There are a lot of thoughts and perceptions on those who do things differently like my daughter. There are even other parents who have no idea what it takes to be me offering their 2 cents of advice. I get it, you want to offer your help.. thank you! Everyone on this earth is different, no two people are exactly the same in any way. The same idea goes for parenting, no one does it the exact same nor should they. I brave this world with my daughter everyday, she does what she needs to in order to center herself and make herself feel good. This may mean that her behavior is looked at like a “behavior” but it’s not different than what we would do to calm ourselves or to show our excitement, joy or frustration over something. It may be different to us but it is not less. I do my best to offer her options that can help her throughout the day. I give her toys, fidgets, sensory snacks and breaks.. all of those actually decrease the amount of time that she will stim throughout the day. This is good for her to have everything that can help her regulate over the day. I have always noticed that with my daughter if she doesn’t have the help throughout the day she will go hard all at once and those are the moments where she will overstimulate herself. So with that being said, watch your kids and see what works best for them. There are ways to help and ways to make it worse, do what will be right for them and not just try to shush them or stop them. This is a necessary part of their being, so adapt and relate to your child. She is the best person I know and even though we do not share long talks about life, we share the experience with each other and the magic behind everything she teaches me as a mom. 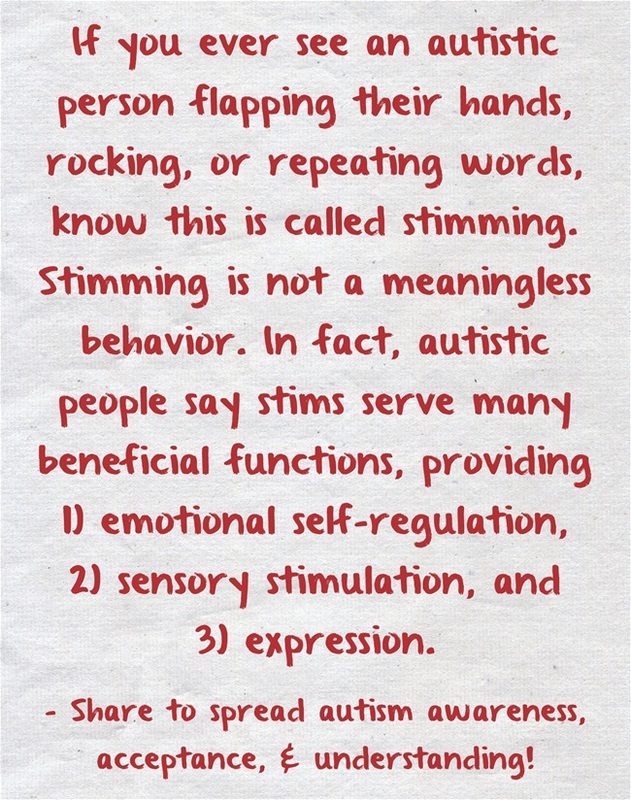 Remember everyone is different, so is the form of stimming from an individual on the spectrum. If your child is hurting themselves while stimming please seek help from a support group, doctor or medical professional. Things can get intense for anyone and those who need sensory supports often need the most support to be ok and regulate themselves, be aware of how to help properly. Oftentimes, these stimming behaviors interfere with a child’s ability to complete activities of daily living and can lead to increased dependence. You never want to just stop and shut down your child if they are seeking sensory input, instead help them in a positive way. Offer daily sensory breaks if your child is on a schedule and offer sensory input items for them. Every child is different no matter what. 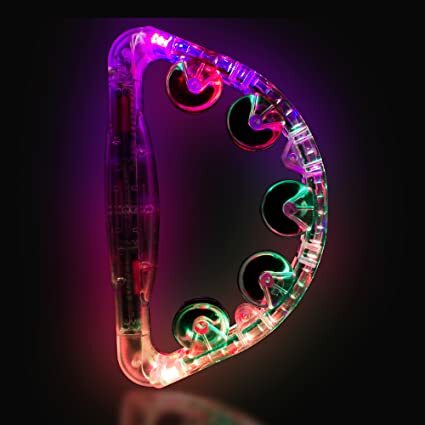 We are a household full of noise toys and items that light up. My daughter has a routine with watching shows, she loves only certain ones. At times it is hard to go places and experience life but guess what, we do it. We do not shut ourselves in. She has thrown her toys at others when she has been over stimulated and she has had some break downs, but I’ve been there to support her and life goes on. She has also had a lot of wonderful moments when her toys and shows bring her so much joy that she laughs the best giggle ever! Keep on doing you and being a parent, just don’t forget to experience life and help your little one with their sensory needs. 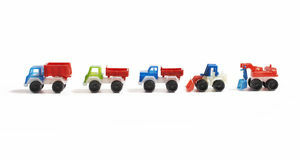 I would love to know what your favorite toys are for sensory in your household. Please comment below and tell me all about them! 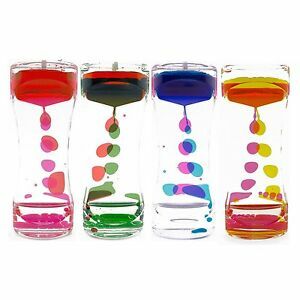 I love learning about new sensory toys. I’ve grown quite a collection of fidgety fun stuff for my daughter to keep by her bed and paw through when she needs it. And I keep a huge collection of Aaron’s putties in a box at my desk for myself. Sensory regulation is often impossible even for adults who don’t recognize what’s happening to them or what they’re feeling, so it’s always joyful when our kids find ways to self soothe in healthy ways. There’s so much I wish I would have had access to when I was a kid!